Milan Michalek has at least one point in 11 of his last 15 games. How is it possible a rigorous 10-minute workout prior to the start of every game could detonate the offensive fury within San Jose Sharks forward Milan Michalek? "Before I injured my knee (in 2003-04), I really never thought about exercising prior to games, but I met a trainer (Paul Gagné) in Montreal after my surgery and he recommended a fitness program," Michalek told NHL.com. "It's been a part of my pre-game routine ever since. I usually do intense biking, jumps and squats and some other things in about 10 minutes and it really gets the blood flowing. I do it about 50 minutes before every game and it has helped." Michalek spends a month in Montreal with Gagné prior to training camp each year. There, he works out for four weeks, training approximately three hours each day in the gym and on the ice. Gagné has given seminars on the subjects of posturology (a relation between body posture and musculoskeletal disorders), injury prevention and training methods. For Michalek, now in his fourth NHL season, the extra work has paid dividends on the ice and in his wallet. After completing his second full NHL season in 2006-07 with career-highs in goals (26), assists (40) and points (66) in 78 games, the Sharks signed their budding 23-year-old star to a six-year contract. "We think he has great upside and will be a dominant player," Sharks Vice President and General Manager Doug Wilson said. "This is the type of player other players want to play with. He may be our best defensive forward, next to Mike Grier. He is a player we want others to emulate." In addition to his fine regular-season statistics last season, Michalek also tied for the team lead with four goals in 11 playoff games. It didn't take long before Jeremy Roenick, who signed with San Jose in September, was sold on Michalek's speed. "I had no idea, even playing against him, the power and the skill he possessed," Roenick said. "He epitomizes pure, sheer talent with brains. I've never seen a guy go from zero to full speed in three strides, but he has that ability. I'd say 98-99 percent of the players need five or 10 strides before they hit their peak. Milan can do it in three and defensemen have fits with guys like that." Michalek currently is tied with Jonathan Cheechoo for the team lead in goals (22), is third in points (46) and fourth in assists (24) through 67 games. He also has worked extremely hard to perfect his defensive game – he ranks fourth on the team in takeaways (32), is 13th in blocked shots (28) and 12th in hits (60). "Milan defines what a multi-dimensional player should be," Wilson said of his 6-foot-2, 225-pound left wing. "He has size, speed, strength, skill and the drive to not only play, but excel in both ends of the ice." Michalek realizes his speed gives him an edge over the opposition. "I have to use my speed whenever I get the chance," he said. "My coaches always tell me to go whenever I can and my teammates have done a great job of knowing how to lead me and pass the puck when I'm on the move." 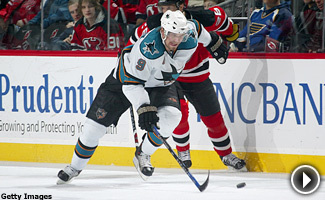 Michalek played only two games for the Sharks in 2003-04, scoring a goal in his first NHL game, in Edmonton on Oct. 9, 2003, before suffering a torn ACL in his right knee in his second game. He re-injured the knee during a rehabilitation assignment with the Cleveland Barons of the American Hockey League in 2004, which ended his season and, following surgery, prompted his visit to Gagné in Montreal. In 2005-06, Michalek totaled 35 points (17 goals, 18 assists) in 81 games and was named the team's rookie of the year. Obviously, it was a sign of things to come. Michalek remains a kid at heart despite his rapid ascent among NHL forwards. In fact, when the topic turned to his older brother, Zbynek, a 6-1, 200-pound Phoenix Coyotes defenseman, he revealed a boyish grin. "Hockey was always big in our family," he said. "We went to practice in the morning before school and then practiced again after school. Then, after practice, we would throw our schoolbags in our room and play outside on the streets (of Jindrichuv Hradec, Czech Republic). It was great." Michalek is glad his brother plays in the Western Conference. It has allowed the two to maintain close contact. "We always get together a day before our teams play each other and go out to dinner," Michalek said. "We discuss our teams and old times. When I was 7 years old I actually played defense with Zbynek, but I guess I smartened up and eventually moved to forward." The Sharks, who tabbed Michalek in the first round (sixth overall) in the 2003 NHL Entry Draft, now are reaping the benefits.